The popular Suite for jazz orchestra No 1 was written early in 1934, a year and a half before the Fragments. 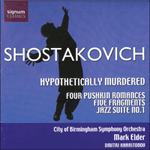 This delightful highly ironic music is a continuation of the spirit of laughter and adventure that has earlier led Shostakovich to work with the great Utiosov on Hypothetically Murdered; and indeed it was probably written for one of the other 'jazz' groups that sprang up on the model of Utiosov's Tea-Jazz Ensemble, sometimes including performers, like Skomorovsky, who had played with Utiosov and who then set up on their own. As with most 'Soviet Jazz' of this period, there's not much jazz here, more a feeling of operetta and cabaret music and also of Jewish songs (which Shostakovich loved). And somehow, as so often with this particular composer's light music, there is always an undertow of depth and darkness, of real sadness and foreboding underlying the sentimentality and parody. The three short movements seem designed as effective dance-numbers and are also the right length for a 78rpm gramophone record. The lilting Waltz and the extremely cheeky Polka subsequently found their way into orchestral guise in some of Shostakovich's later ballet music. But the finest movement is undoubtedly the alternatively menacing and hilarious Foxtrot, subtitled Blues; it is worth noticing that it is neither a foxtrot nor a blues.